Bois Giraud formed part of the ancient fief belonging to the ‘Lords of the Manor’ of Breil, which was owned by the De Terves family in the 16th and 17th centuries. 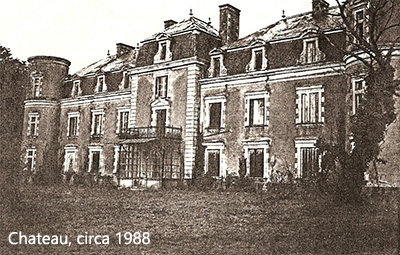 In 1850 the current chateau was constructed by an Englishman, Mac Alister, which was purchased by the Marquis de Gibot. In 1920 the chateau was gifted to his acquaintance Comte D’Anthenaise. After the death of Comte D’Anthenaise in 1987 the chateau was sold to Jean Dumas, a protestant pasteur from the Cevennes, who wanted to use it as a holiday retreat for his parishoners – family circumstances intervened and he was forced to sell the chateau in 1990. Robert and Anne Francis who purchased the property completely renovated and refurbished it to use for themselves and let out. In 2001 the Earl of Macclesfield purchased the property which was used as a holiday home until 2011, at which point it was decided it was too big. His three daughters now own the property and rent the chateau for others to enjoy, whilst still enjoying the odd family holiday here themselves. We welcome you to come and experience the chateau for yourself – its large size makes it the perfect family holiday location to explore the surrounding region of the Loire.